TrackingPoint is rolling out of new line of AR-15 rifles equipped with their smart scope technology. More than just semi-auto rifles with a smart scope slapped on, these guns have a host of new features that takes things to a new level. The changes represent a shift from hunting rifles to military hardware. The rifles are the TrackingPoint AR 556 and TrackingPoint AR 300, chambered for 5.56 NATO and 300 AAC Blackout, respectively. The smart scopes have a 2-12x magnification range. When powered on, the smart scope works just like an AR-pattern rifle with a red dot sight. The trigger functions just like a standard trigger; take it off safe, get on target and fire. This allows the rifle to “just work” in an urgent situation. The technology won’t interfere with the gun’s ability to work like a “dumb” rifle. In “Freefire” mode, the scope kicks in but the shooter maintains full control of the trigger. In this mode the user tags their target with a button integrated into the trigger guard. The scope will use its laser rangefinder and other sensors to measure the distance to the target and detect the position of the rifle. Using this information, the scope corrects for bullet drop and rifle cant by manipulating the position of the reticle. As far as the shooter is concerned, it still functions like a scoped rifle, with the advantage of having a computer-corrected ballistics solution tailored to the target’s position relative to the user built in to the reticle’s zero. 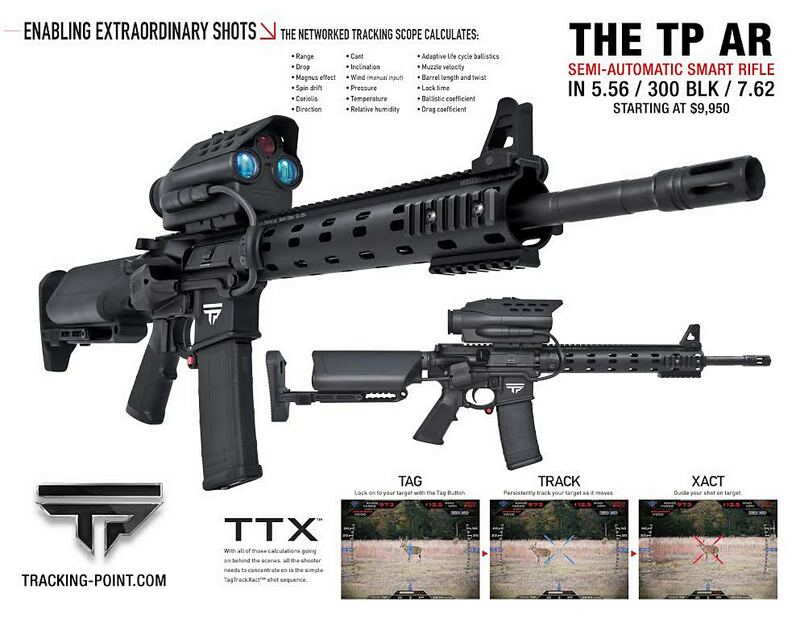 It also maintains the “Advanced” mode of TrackingPoint’s higher-end rifles. Called “Tag Track Xact” or TTX, this is the function that gives any shooter the ability to shoot like a marksman. In Advanced mode, the rifle operates the trigger eliminating human error. Once a target is tagged, the computer generates a ballistics solution and will only fire when the rifle is perfectly aligned with the target. In both Freefire and Advanced mode the scope also corrects for lead in the case of moving targets. The smart scope is packed with image recognition software to track moving targets even if they turn around. The effective range of the scope’s target tracking ability is 500 yards, which is far enough for the majority of encounters in combat. The rangefinder can be used for targets out to 750 yards, which is on the outside edge of most shots taken with AR-pattern rifles. Like previous TrackingPoint systems, the smart scope has a wireless transmitter that allows it to stream video from the reticle to mobile devices, including iPads, iPhones and Android devices. 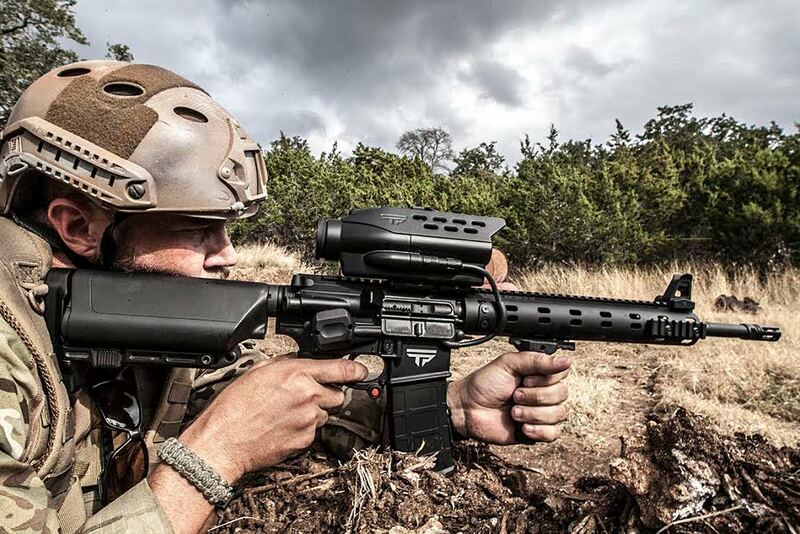 Where things get interesting is that TrackingPoint is working on pairing these rifles with Google Glass devices. This will allow the user to see through the scope without having to get behind the rifle. What this means is that these smart guns can be used to shoot around corners or over cover with a truly minimal amount of exposure to the user. Combined with the Advanced mode that all but guarantees a perfect shot, this fundamentally changes the way rifles can be used. Priced at just under $10,000, these are considerably more affordable than other TrackingPoint rifles, which run between $20,000 and about $28,000. We don’t expect the Army to roll these out on the battlefield tomorrow, but they are low-priced enough that they could be used by select units. At 10.3 pounds, it is not much heavier than most designated marksman’s rifles, and lighter than any M14-based DMR. The U.S. military has been playing around with TrackingPoint rifles since they became available, and so have many local police departments for use with SWAT-type units. There is no doubt that these guns are going to be popular with those users who will want to develop new tactics with these ground-breaking guns. They will also no doubt be popular with hunters looking for a more accessible TrackingPoint rifle. Being able to track game out to 500 yards is about as far as humane culls can be made with 5.56 or 300 BLK. Part of what makes these guns less expensive is the use of off-the-shelf parts and accessories. They are fit with a good amount of Daniel Defense furniture and Magpul accessories, which are some of the best in the game, but they’re not the custom-built Surgeon rifles used to make TrackingPoint’s long-range guns. More details and specifications regarding these new smart scope-equipped AR-pattern rifles can be found at the TrackingPoint website.